Take a little more transit and eat a little less meat — are two things you can do to help the environment. In this installment of Meatless Mondays with Metro, let’s check out Something Healthy. Something Healthy’s vision is to “serve up a healthier, active lifestyle throughout the greater Los Angeles area and The World.” The cafe serves up soups, salads and sandwiches with plenty of veggie and vegan meat options. 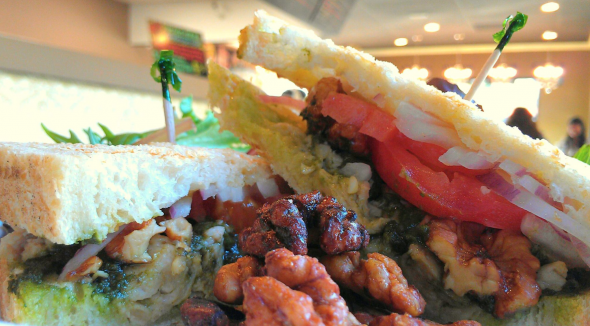 The Compassion Club vegan panini. Photo: Something Healthy official Facebook page. To visit Something Healthy, take Foothill Transit Line 187 to Huntington/Shamrock. I have been there before, good food. Need to go back. Not too far of a walk from 2 Gold Line stations. In my long term goal of walking the length of the Gold Line this segment is still open. Sounds like I should do it next week.